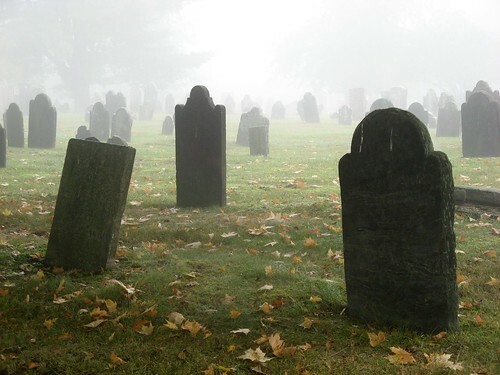 misty graveyard, originally uploaded by jahansell. We've had some foggy mornings lately - creating lovely scenes all around. There's a cemetary clean-up day coming up soon, sponsored by the historical society - volunteers needed to clean the headstones. I hope I can make it. ooooohhhh! scary! love the photo! did you do one for October 1st -- cemetary theme day?? That should be quite an interesting day. Seeing those tombstones cleaned up and being able to read about and sometimes wonder about all these people who died. This would have made a great theme day photo as well but I really like the one you did...I don't go visit people I know that have died at the grave but I like to walk and see the history at other cemeteries.....it's nice there is a clean up ....the one in my subdivision is pretty sad...no one is ever there...hard to when the gate it locked. wow, what a cool shot. It's almost like a Hollywood movie scene. That looks like a great shot for Halloween.